5 BerryWorld breeders "win a genome"
Technical managers from Tesco have visited Spanish fresh produce breeder and plant nursery owner Planasa to see its new blueberry varieties. 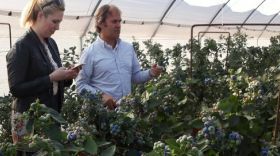 The company’s upcoming blueberry programme, which will launch in October, features six commercial varieties that have been trialled since 2016. These include two ‘ulta-early’, three ‘very early’ and one 'mid-season' variety. Each has a shelf life of at least 24 days in cold storage. During the visit to Planasa’s facilities in Huelva, Sabina Wyant, technical manager at Tesco UK Produce, and Pablo Brocal, Tesco technical manager in Spain, were shown the varieties’ R&D trials, before taking part in blind tastings together with Planasa’s sales and marketing manager for EMEA, Gonzalo Artés. Wyant commented that Tesco is looking for “flavour, shelf-life, size and appearance, but mainly flavour”, with Planasa reporting “very positive” feedback on the blueberry varieties from Tesco after the visit. In addition, the Tesco managers checked out the breeder's blackberry programme which will be launched by 2020.